Cleta Alberts, age 92, formerly of Hampton and Aurora, passed away Saturday, January 6, 2018, at Memorial Community Care. Funeral Services will be held at 10:30 A.M., Friday, January 12th at Aurora United Methodist Church. Rev. Ron Harris will officiate. Interment will be in the Hampton Cemetery. Visitation will be from 5 - 7 P.M. Thursday at Higby-McQuiston Mortuary in Aurora. Memorials may be made in care of Omaha Central High School Foundation. Condolences may be e-mailed to the family through the mortuary website at www.higbymortuary.com. 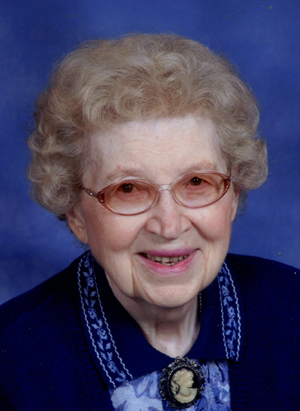 Cleta Marian Alberts, the daughter of Harold and Eunice (Jensen) Hunter, was born at Omaha, Nebraska on October 17, 1925 and passed away at Aurora, Nebraska on January 6, 2018, at the age of 92. She grew up in Omaha and graduated from Omaha Central High School, where her granddaughter, Molly, currently teaches. Cleta was married to Alfred ‘Alf’ A. Alberts on January 19, 1947 at Gothenburg. They moved to a farm northwest of Hampton where they farmed for 43 years. They moved into Hampton in 1996. Alf passed away on June 30, 2010. Cleta enjoyed several years living at East Park Villa. Cleta was a member of Aurora United Methodist Church and the American Legion Ladies Auxiliary. She had served on the Hamilton County Election Board and was the first female on the Hampton School Board. She also volunteered for the Blood Bank over the years and was a Pink Lady at Memorial Hospital for several years. She was preceded in death by her parents; husband, Alf; two brothers, Richard C. and Ralph W. Hunter and sister, Reva Fuerstenberger. Those left to cherish her memory are her two sons, Michael (Janet) Alberts of Marquette and Dan (Beth) Alberts of Lincoln; 5 grandchildren, Tammie (Ryan) Bamesberger, Jeff (Katrina) Glinsmann, Rick (Tessa) Glinsmann, Hillary (Kieran) Lyons and Molly (Luke) Jensen; 14 great-grandchildren; 5 great-great grandchildren and many nieces and nephews and family members and friends.